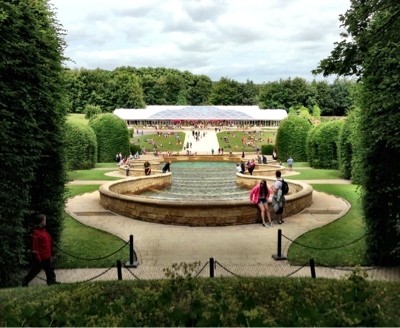 Now we LOVE Alnwick garden and have visited every year since it opened. It is a fabulously different North East attraction and always has something new to explore. Today's visit was the busiest it's ever been! The walk from the car park followed by the queue to get our tickets verified took about 40 minutes! Not ideal when you have 3 small children with you! They were good as gold though and entertained/amused by the buskers and stalls outside the ticket stands. Once we were inside the garden, I remembered that it was certainly worth the wait. 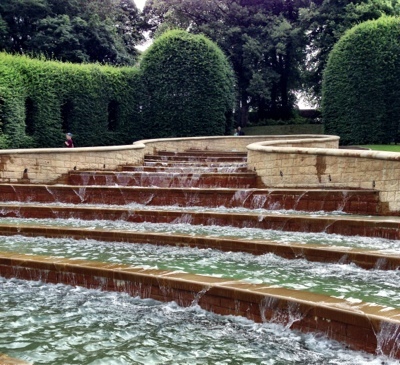 The central cascade with various dancing water shows is simply stunning. Although there were a lot of visitors, it did not seem overcrowded. We picked a spot on the grass to set up camp and enjoyed our picnic whilst watching the ever changing central water cascade. The kids were very eager to put their swimming gear on. So after a quick change we headed to the water garden which has different water features which the children can play in spread throughout. Halfway through we found ourselves in the middle of a water fight which are arranged at various times throughout the school holidays. 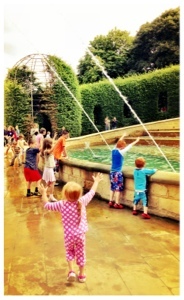 It's always a good idea to pack a change of clothes as the kids really do get soaked! 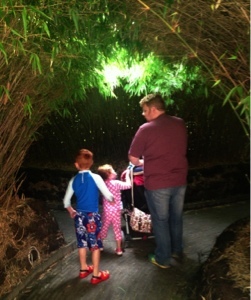 Next it was time to enter the bamboo labyrinth! This is part if the garden I hadn't visited before and I've got to say after we were trapped in the maze at Longleat I wasn't looking forward to it! The kids insisted though and although slightly challenging, I don't think anybody would end up trapped in here! Phew! 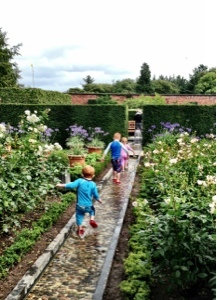 After we escaped the labyrinth we quietly wandered around the rose garden and up to the top ornamental garden. These areas are very tranquil and peaceful and have a completely different atmosphere to the lower parts of the garden. They are my favourite parts of the garden though and I hope I get to visit them one day child-free so I can really take my time to explore. The view from the top of the garden is worth the walk. It's beautiful. 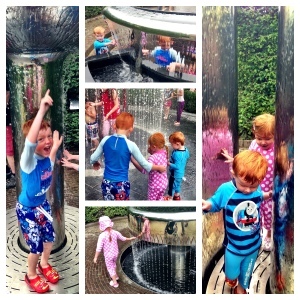 Now it was time to walk down past he fountains and the kids were squealing with laughter as they tried to avoid the water jets which can catch you at any time! 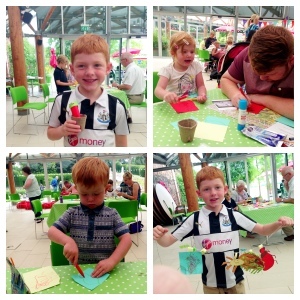 This week was bee week at Alnwick garden so we took advantage of the free bee themed crafts that were on offer. We spent over an hour together as a family making an insect garland which was lovely. 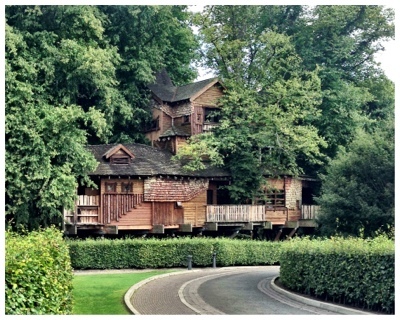 Finally, a visit to Alnwick garden would not be complete without a trip to the famous treehouse. If you ever get the chance, the food here is amazing! (As is the atmosphere). Sadly we didn't dine today and instead had fun on the 'Indiana Jones' style bridges and enjoyed the views. There was a lot of the garden we didn't get a chance to do/see today and it is certainly worthwhile buying an annual pass. They also had a 'pop-up' vintage Afternoon tea marquee which looked lovely, a children's bee theatre, bee talks and demonstrations and of course the deadly poison garden tours on offer but time just seemed to run away with us! Hello and Thank you so much for this gorgeous blogger post. 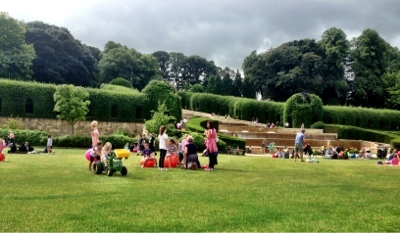 We loved that you had so much fun with all the activities and areas that The Alnwick Garden has to offer. I and my team ran the water pistol fights all through the summer and we all recognise your children from the pictures you put up above. We know they had a good time with us, we were always out gunned by their crack shot marksmanship! You'd be pleased to know we have a full programme of activities coming for Autumn and Christmas so we'd love you to return for more fun. Pistol Man and Social Media Bod.